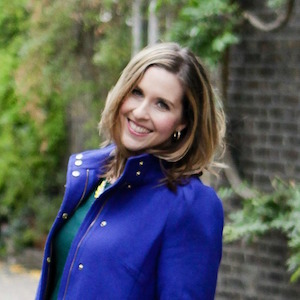 You are here: Home / Blog / Side Dishes / Orange Cranberry Sauce = the Holidays Are Here! 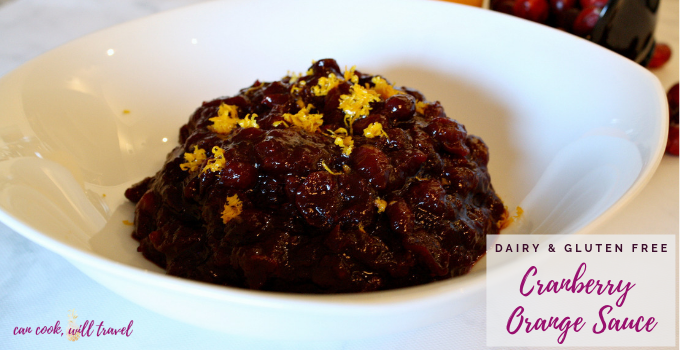 Orange Cranberry Sauce = the Holidays Are Here! Ah cranberries are one of my favorite things about this time of year, because I love everything about them. Now my personal favorite is cooked cranberry sauce thanks to the sweet and tart flavors. But I was wanting to put my own spin on it, so that’s where this Orange Cranberry Sauce came in. So I’ll be honest here that this week has been bonkers. I feel like as I type this I still haven’t slowed down, so I can’t wait for a little peace and quiet over Thanksgiving. I’m not sure I plan to do anything the following day either, because I took the day off. But back to cranberries, because they really inspired my cooking this week. I bought two huge bags at Trader Joe’s, and now I realize that little ol’ me can’t possibly use all of those. Whoops! But I know I can find plenty of things to eventually use them for. This morning I made cranberry scones based off of this yummy recipe here, and then of course this Orange Cranberry Sauce as well. The normal cranberry sauce I make is just water, sugar, and cranberries, and it’s crazy good. I wanted to change it up, so I added some orange flavors in the form of orange juice and zest. And then I also decided to try out coconut sugar to omit refined sugar. The verdict is that it’s not as tart as the traditional cooked sauce I make, because the coconut sugar adds a kind of rich flavor to it. I love coconut sugar, because it really has a deep flavor kind of like a mix of molasses and brown sugar. Yum! I love topping this sauce with some orange zest, and I also wanted to infuse the Orange Cranberry Sauce with some Fall flavors. So I added cinnamon and allspice for a warmth to it. 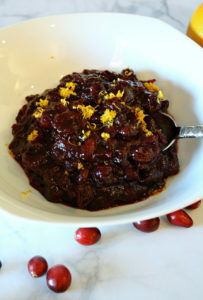 I especially love this Orange Cranberry Sauce, because it can be made in advance. As someone who helps cook on the holidays, it’s really all about timing and planning. So this recipe assures you can whip it up the day before, which I love. And I think it’s a great option for people who don’t love the tartness of cranberries, because it’s really subtle in this dish thanks to the coconut sugar. 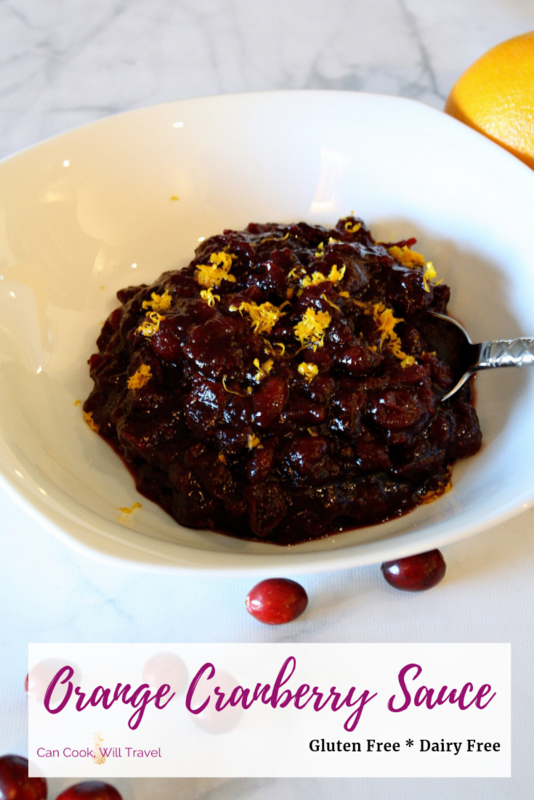 So if you find yourself with lots of cranberries on hand like me, then this Orange Cranberry Sauce is a great way to use them up! So click that link for the step by step photos and go enjoy cranberry season! Happy cooking! 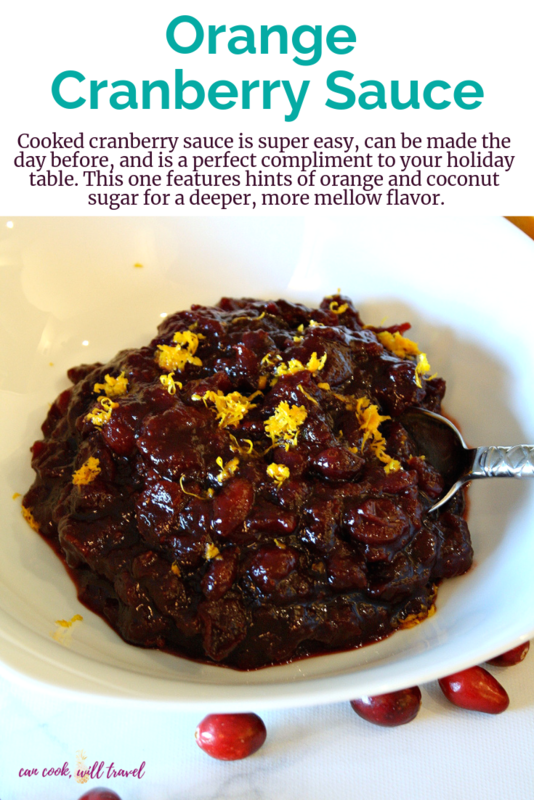 Cranberry sauce is a holiday favorite, and this one with a citrus twist and deeper sweetness thanks to coconut sugar make it a great holiday dish! Begin by juicing enough of an orange to get about 1/4 cup of water and then fill up the rest of the measuring cup with water until you have 1 cup of liquid total. Add the liquid and 1 cup of coconut sugar to a pan and bring it to a boil. Then add the cranberries, cinnamon and allspice and cook for 10 minutes or until the sauce is thick. Remove from the heat and stir in about 1 teaspoon of orange zest and then transfer the sauce to a glass dish. Then cover with saran wrap so the wrap touches the top of the sauce so it doesn’t form a skin. Chill completely and the enjoy, so feel free to make this a day in advance! Top with extra orange zest and then dig in! Quick Tip: You can use regular sugar instead of coconut sugar, but I used the latter to avoid refined sugar and it's lower on the glycemic index. Two years ago: Thankful for Thanksgiving Vegetable Dishes! Three years ago: Apple Pie Pancakes . . . Yes, They’re Just As Good As They Sound! Six years ago: Apple Cranberry Pie … Happy Thanksgiving to Me!